September 7, 2014 Nefer Khepri, Ph. D.
Visionary Art ~ “refers to art produced by self-taught individuals, usually without formal training, whose works arise from an innate personal vision that revels foremost in the creative act itself.” ~ The American Visionary Art Museum. “Visionary art encourages the development of our inner sight. To find the visionary realm, we use the intuitive inner eye: The eye of contemplation; the eye of the soul. All the inspiring ideas we have as artists originate here.” ~ Alex Grey, visionary artist & author of Sacred Mirrors. 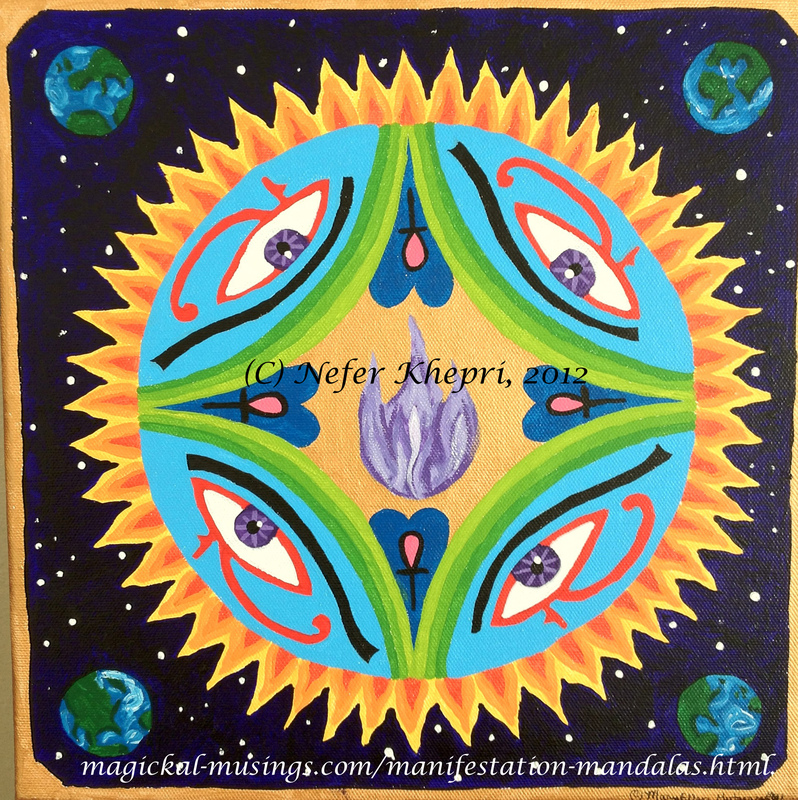 I create Soul Portraits and Manifestation Mandalas, which are two forms of visionary art. I have been creating Soul Portraits since 1998 and Manifestation Mandalas since 2011. When I create a piece of visionary art, I am tuning in to my spirit guides and my clients’ spirit guides. I receive mental images of symbols, sometimes in full color, sometimes not. I am then instructed via clairaudience (yes, that means I hear voices in my head) as to exactly where to place each symbol within the overall composition. Once the initial drawing is complete for each section I am shown which colors to use, or simply told something along the lines of, “No, not Indigo Blue. Use Prussian Blue instead.” If you’re an artist you’ll know there’s very little difference between those two shades of blue, yet many spirit guides make such distinctions often. My visionary art serves two distinct purposes, hence the two separate services. A Soul Portrait is a symbolic depiction mapping out where your Soul currently is regarding your own spiritual evolution. Symbols, as well as the meaning of colors that appear in a Soul Portrait depart knowledge regarding lessons learned, lessons yet to be mastered, and those lessons we may prefer to forget. A Soul Portrait is basically a map of one’s Soul and your progress up until now. Each piece is created and infused with Reiki energy so when my client gazes upon their Soul Portrait these positive energies are released into their life time and time again. A Manifestation Mandala I created for myself. Copyright Nefer Khepri, 2011.
to provide me with a list of 1 – 4 wishes they wish to manifest in their lives. The wishes could be for anything. I then meditate to connect with my client’s energy while focusing on their wish list. As with my Soul Portraits, symbols and colors then begin to come to me that result in a completed Manifestation Mandala. Once again, I create each piece while channeling Reiki energy into it. Every time my client looks at their Manifestation Mandala they are reiterating their wishes, affirming their wishes are attainable, and those same positive energies are released again and again into my client’s life in order to help those wishes to become my client’s reality. Every Soul Portrait and Manifestation Mandala begins with a meditation session. The session lasts anywhere from 20 minutes to two hours. Images come, sometimes fast and furious, sometimes painstakingly slow. As I sit in meditation I am also aware of my surroundings so that when symbols begin to come through I am conscious enough to be able to create very quick rough sketches of what I am seeing with my mind’s inner eye. Sketch of Raechel’s Soul Portrait. 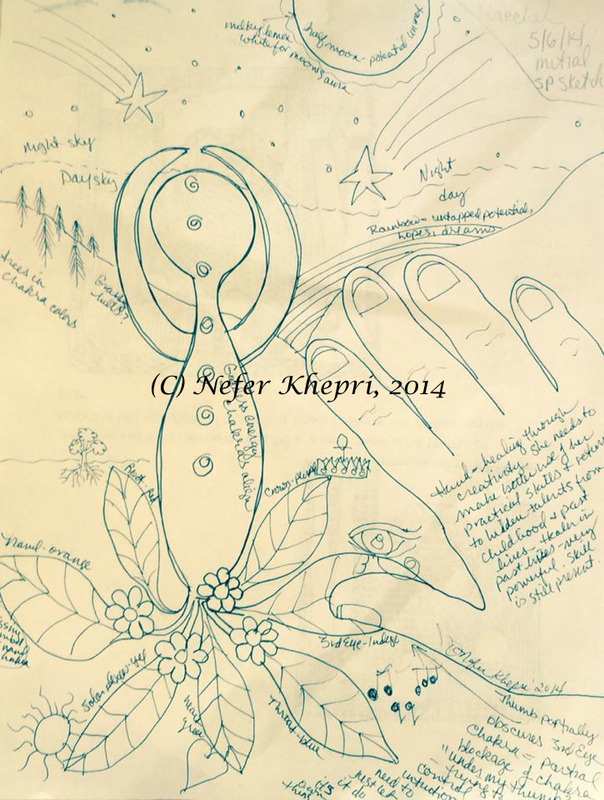 Copyright Nefer Khepri, 2014. I enjoy working on each piece of visionary art so much because they are not MY compositions. I never know what a clients’ guides or my guides will suggest regarding symbols or even the use of color. I had serious doubts when I was shown that hill on the right of Raechel’s Soul Portrait should be PINK, but decided to follow higher guidance; and, I’ll be darned if that pink doesn’t work really well, plus the meaning of the color merges with the deeper overall meaning of Raechel’s Soul Portrait. Despite the times when unusual colors come forth (there was a time I created a brown sky, another time a green sky) the piece of visionary art manages to turn out just fine. Each Soul Portrait and Manifestation Mandala is special in its own way & on its own merits. Each one affects me differently as I work on it. I found this one to be particularly healing. Must be that green goddess figure as we all know green is the color of healing. The horse on the far right showed up after all the other symbols had been received & I didn’t even think anything would go there, but when the horse came through & I showed Raechel, she shared with me that the horse had very special personal significance to her. This not only validated the symbols I received for her, but it also validated my work as a whole. I am often told by clients that a particular elements or elements of their Soul Portrait or Manifestation Mandala means something special to them, yet I had no conscious knowledge of that at the time I created the piece. It is always a great honor to create a piece of visionary artwork for someone else. I am always humbled by the experience and once a piece is completed I always find I have received some type of a healing that many times I was not even aware I was needing. That is always a very lovely added bonus. I have decided to branch off my visionary artwork to its own website. I am still at Magickal-Musings.com, and always will be (have been there since 1997), but will be removing my visionary art links there so my main site can focus on my readings and candle work. 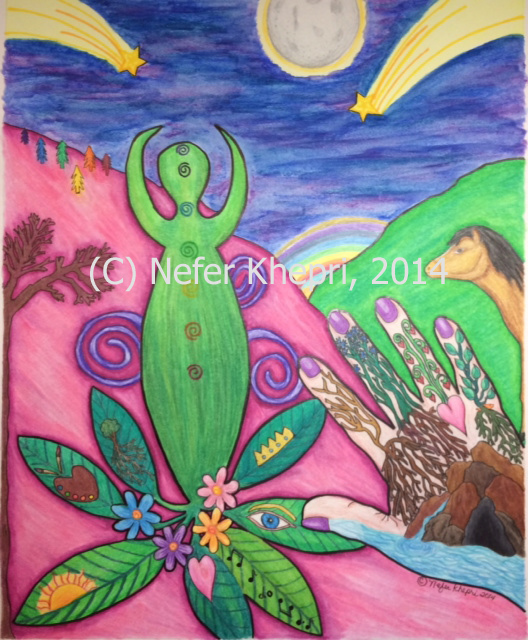 My visionary art can now be found at its new home: The Visionary Art of Nefer Khepri. I hope you all enjoy the new site. It was a real experience designing it (someone could have done a case study on me regarding Trial and Error! ), but I’m happy with how it looks. Art IS alive. Art is a living thing, especially when you consider all the time and personal energy each artist places into every piece they create. I consider Art to be as great a blessing to me as Reiki and I hope that one day soon you will grant me the honor of creating a Soul Portrait or Manifestation Mandala for you or a loved one. Until next time, wishing you all many blessings! My Forthcoming “Aloha Spirit of Maui” oracle deck.